THE GLOSS GUIDE: Are you getting your greens? Happy Friday loves! I wanted to quickly share a product I'm really in love with right now. We all know that if we want beautiful, glowing skin we have to eat lots of fruits and veggies, water, etc. You know the drill! My skin was becoming super dehydrated from all the coffee I was drinking. I needed an extra boost in the afternoon, but have been feeling guilty having that extra cup (plus not sleeping well from the caffeine). I knew I wanted something in the form of a drink (I'm a sucker for health drinks in general). I tried drinks mixes from Vega One and New Chapter Organics from Whole Foods and I cannot deal with the horrendous taste. If it tastes bad just count me out! 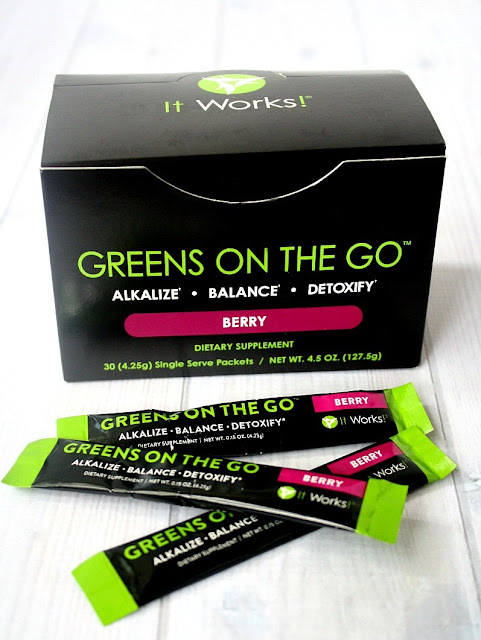 I started ordering the ItWorks Greens on the Go (I like the Berry flavor) from a friend and became completely obsessed with them. They are in little individual to go packs so you can just add them right to your water bottle without measuring any powders. I'm getting that extra boost of energy I need, plus all my greens for the day that I am seriously lacking. I love that it is non-GMO and pesticide free, so I never have to worry about what I'm putting into my body! A HUGE plus, I noticed my skin was becoming extra clear and way less dehydrated looking. So for anyone needing their daily dose of greens, plus some extra energy- I highly recommend these! I usually am not into the whole "pyramid scheme" selling stuff, but this is a product I am obsessed with. I made a page for you to easily shop for them here instead of purchasing from someone you don't know, etc. (since we're bff's right?!). I hope you enjoy them as much as I do! It has really made a difference in my energy levels and overall feeling of well-being! Shop Greens on the Go here!